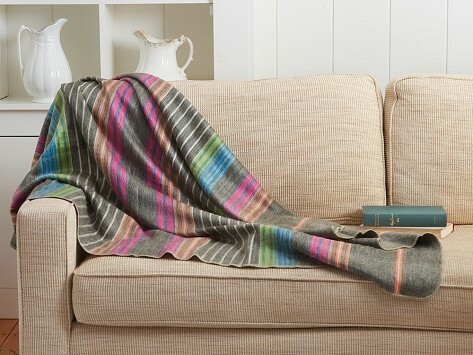 An alpaca throw from Shupaca is a luxe-looking upgrade to the typical fleece blanket tossed on the couch. Brushed alpaca wool feels silky-soft and warm and is hypoallergenic, lightweight, and breathable, so you can get cozy without feeling overheated. The modern finish of the blanket is one you’ll be happy to have on display at home. Each blanket is handcrafted in Ecuador by artisans using traditional wooden looms, who are paid fair wages. Dimensions: 45" x 70" x 0.03"
This was shipped on time and is all as advertised ! Great gift. This was a luxurious gift that will give casual comfort for a long time. Love this throw. I purchased it in the teal and green color. The colors are softly muted and go perfectly with my furniture. The texture makes you want to curl up in it. I live in FL so the weight of the throw is of importance. Highly recommend! Besides its silky softness, alpaca wool is a great choice for a blanket because it’s hypoallergenic, lightweight, durable, and breathable. And did we mention the softness? There’s zero itchiness here, unlike with other wool. Though the throws are made with decidedly old-school methods, the finished result is anything but dated. It has a modern vibe that—paired with snuggly warmth—makes for a blanket you’ll always want to have within reach.